Greenfield Village in Dearborn, MI was extremely interesting, both for what was there and for what it said about Henry Ford’s interests. Ford relocated buildings that represented important innovations of his day. These included Thomas Edison’s home, workshop, and early electrification station. In addition, there was an operating railroad roundhouse where steam locomotives were still being repaired and serviced. 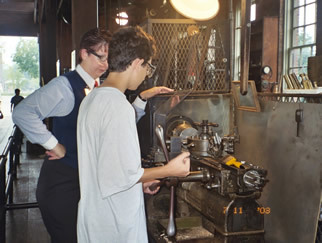 (The roundhouse had some amazing machining tools, very large and used to make and repair parts for the trains. I was dying to go down to the floor and take a look, but the guide said he could not let me for safety reasons.) There was also an interesting display to explain how the burning coal was used to create steam, which then moved the pistons, which turned the wheel. I had never noticed the box at the end of the piston, where the steam actually came in and forced the piston to move. I still did not understand this fully—it seemed that the steam would have to be pulsed into the box so that the piston could move back into position between each stroke? One of the highlights of Greenfield Village was the machine shop, where we had the chance to actually “cut metal” using a 1917 Brown and Sharpe turret lathe. Both my son and I took our turn to don safety glasses, and make a small brass candlestick. With apologies to “real” machinists, since I will not know the official terms for what we did, here is what I observed. The mechanism was fascinating and so well thought out: the cutting tools were brought to the rotating brass rod by a mechanism that was hand-turned. We turned the handwheel counter-clockwise to move the bits to the left, and clockwise to pull back when the cut was complete. At the extreme of the turn, the piece holding the various bits (I think this was the “turret”?) would rotate and click into place so that the next bit was in position. I think there were 6 different cutting steps—two were used to drill out the center hole of the candleholder (for the candle), two removed excess metal from the outside of the piece to save wear on the carbide cutter that actually produced the curved shape of the candlestick. 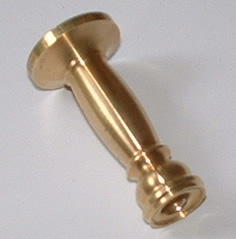 A final cut was a blade that cut the finished candlestick from the brass stock. These last 2 cuts were made by turning a separate handwheel that moved the rotating brass “south” to the carbide shaping blade, and “north” to the blade that cut the finished product from the brass bar. With one small project under my belt, I begin to see how people get hooked on cutting metal. Time to move the cars out of the garage, and start moving old metal in! Hi I have not found any toasters made in USA think that is game over. 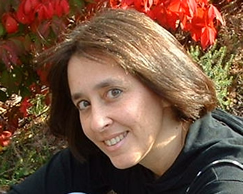 Regarding stillmadeinusa website you might want to recheck Earth Creations T shirts. Unfortunately it looks like they have shut down the US factory. Most of the shirts that I saw in earth site said 'made in Nicaragua of US fabric'. Also the upcoming trade deals with Columbia and Panama are going to be another big blow to American manufacturers. They in Columbia are not going to rush out and buy more expensive US made products it’s just trade deal hype-just like with NAFTA-call your Rep! Thanks for keeping the Still made in USA site up and running-it just needs updating. Operating and fixing a machine is one effective way of a “father and son” bonding. I remember when my dad and I fixed our car and after that, fixing the engine of our car became our bonding time. It's really surprising that such a well-known and well-crafted car such as the Ford could be made out of a manually operated rotary machine. Indeed, mankind has reached far and wide in technology.